Plants creeping or erect, branching, rarely simple, abounding in ducts, with the leaves small, numerous, crowded, entire, lanceolate or subulate, 1-nerved. Fruits sessile, axillary or crowded into a spike, 2-valved, containing few rather large spores, or numerous minute ones appearing like powder. Genera 5, species200 ? Like the Equlsetaceae, these plants appear to have been very abundant in the first ages of the world, and to have attained a gigantic size, although at present but a few feet in length. Properties unimportant. Some are emetic. The powder contained in the sporangia is highly inflammable, and is used in the manufacture of fireworks. LYCOPO'DIUM, L. Club Moss. (Gr. a wolf, a foot.) Spore cases all of one kind, 1-celled, reniform, opening transversely, 2-valved; spores numerous, minute, sulphur-yellow. - Lvs. in 4, 8 or 16 ranks. 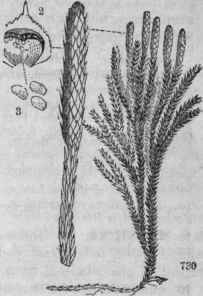 780, Lycopodium dendroidemn. 731, A single spike. 732. A scale with its axillary sporange bursting. 733, Spores. 1 L. clavatum L. Common Club Moss. St. creeping; branches ascending; lvs. scattered, incurved, capillaceous-acuminate; spikes in pairs, rarely in 3s, cylindrical, pedunculate; bracts of the spike ovate, acuminate, erosely denticulate. - A well known evergreen, trailing upon the ground in shady pastures and woods, common. Stem and branches clothed with numerous linear-lanceolate leaves which are entire or serrulate, and end in a pellucid, curved bristle. Spikes perfectly straight, parallel, erect, and upon an erect peduncle. July. 2 L. complanatum L. Festoon Ground Pine. St. trailing; branches dichot-omous; lvs. 4-ranked, unequal, the marginal ones connate, diverging at apex; the superficial ones solitary, appressed; ped. elongated, supporting 4 - 6 cylindric spikes. - A trailing evergreen, common in woods and shady grounds. Stem round, creeping among the moss and leaves, often 10f in length. Branches numerously subdivided, compressed, somewhat resembling the brauchlets of the cedar. Lvs. minute, very acute. July. 4 L. Carolinianum L. Southern Ground-Pine. St and branches creeping; lvs. lanceolate, entire, appearing 2-ranked, the lateral rows spreading with the 2 intermediate rows appressed; peduncle erect, solitary, elongated, bearing a single spike; bracts sublanceolate, entire. - In muddy grounds, N. J. to Ga. Both the stem and its branches are prostrate, with erect, slender peduncles 3 - 6' high. July. 5 L. dendroideum Michx. Tree Club Moss. Ground Pine. St. erect; branches alternate, crowded, dichotomous, erect; lvs. linear-lanceolate, in 6 equal rows, spreading; spikes several or many, 1 on each branchlet. - An elegant little plant, common in woods, readily distinguished by its upright, tree-like form. Plant about 8' high, with branches more or less diverging. These are subdivided into numerous, forked branchlets, radiant, so as together to represent a spiral arrangement. Spikes 2 - 6, an inch long. July. β. obscurum. (L. obscurum L.) Branches spreading; spike one. 6 L. annotinum L. Interrupted Club Moss. Si. creeping; branches twice dichotomous, ascending; lvs. in 5 rows, linear-lanceolate, mucronate, spreading and serrulate near the tip; spike oblong, solitary. - In mountain woods, N. Eng., Can. Branches subdivided near their base, branchlets simple, 4 or more, 6 - 8' high. Leaves at length reflexed at end. Spike rather cylindric, an inch in length, distinct from the branch. July. 7 L. alopecuroides L. Fox-tail Club Moss. St. creeping, subramous; branches simple, long, ascending, bearing a single sessile spike at top; lvs. linear-subulate, ciliate-dentate at base, spreading; spike leafy. - Swamps, N. J. to Fla. and La. Stem extensively creeping. Branches 6 - 16' high, rarely subdivided, densely clothed with a fine, soft foliage. Spike 1 - 2' long, very leafy. Aug.
8 L. inundatum L. Marsh Club Moss. St. creeping, often submersed; branches simple, solitary, erect, with a single leafy spike at top; lvs. linear, scattered, acute, entire, curved upwards. - In swamps, Can. to Car. Spikes 1/2 - 1' long, at the summit of branches which are 5 - 7' long, arising from the base of the stem. Bracts of the spikes leaf-like, dilated at base, spreading at the end, larger than the stem leaves which are 1 - 2" long. July. 9 L. lucidulum Mx. Shining Club Moss. St. ascending, dichotomously divided; lvs. in 8 rows, linear-lanceolate, denticulate, shining, spreading, or a little reflexed; sporanges in the axils of leaves not changed nor crowded into a spike. - In wet woods, U. S. and Can. The foliage of this species is dark green and shining, more ample than is common to the genus. Stems 8 - 16' long, nearly erect. Leaves 3 - 5" long, distinctly serrate. Thecae hemispherical or reniform, in the axils of the leaves near the top of the stem. Jl. 10 L. Selago L. Fir Club Moss. St. erect, dichotomously and fastigiately branched; lvs. scattered, imbricate, lance-linear, entire, rigid and pungent, but awnless. - A smaller species than the last, found on the summits of the White Mts. Stems 2 to 6', branches compact, densely clothed with stiff, shining, spreading leaves arranged somewhat in 8 rows and 2 - 3" in length. Sporanges axillary. Aug.
4 S. ornitliopodioides Spr. Bird-claw Moss, Lvs. semieordate, ovate, obtusish, entire, in 4 rows, the lateral spreading, distant below, crowded above, the superficial much smaller, appressed; spikes lateral, axillary, sessile; stems and branches prostrate. - Greenhouse and gardens. A pretty moss-like creeper, with light green foliage. † Eur.